Jiminy Cricket first appears inside a large plant in a large house, exploring and singing "I'm a Happy-go-Lucky Fellow", until he happens to stumble upon a doll, a teddy bear, and a record player with some records, one of which is Bongo, a musical romance story narrated by actress Dinah Shore. Jiminy decides to set up the record player to play the story of Bongo. The story follows the adventures of a circus bear named Bongo who wishes he could live freely in the wild. Bongo is raised in captivity and is praised for his performances, but is poorly treated once he is off stage. As such, while traveling by a circus train his natural instincts urge him to break free. As soon as he escapes and enters a forest, a day passes before his idealistic assessment of his new living situation has been emotionally shattered and he experiences some hard conditions. The next morning however, he meets a female bear named Lulubelle. The two fall in love, until Bongo immediately faces a romantic rival in the brutish, enormously-shaped bear named Lumpjaw. Bongo fails to interpret Lulubelle slapping him as a sign of affection and when she accidentally slaps Lumpjaw, he claims her for himself, forcing all other bears into a celebration for the "happy" new couple. Bongo comes to understand the meaning of slapping one another among wild bears and returns to challenge Lumpjaw. He manages to outwit Lumpjaw for much of their fight until the two fall into a river and go over a waterfall. While Lumpjaw is swept away and never seen again, Bongo's hat saves him from falling down and he finally can claim Lulubelle as his mate. Bongo later aired as an individual episode on a 1955 episode of Walt Disney's anthology TV series with new introductory segments, which used Jiminy Cricket's narration and singing replacing Dinah Shore's. The short was released separately in 1989 in the Walt Disney Mini-Classics line. This segment is narrated by Edgar Bergen in live-action sequences, who, with the help of his ventriloquist dummies Charlie McCarthy and Mortimer Snerd, tells the tale to child actress Luana Patten at her birthday party, with Jiminy listening in after having read an invitation shortly after the previous story ended. The short later aired as an individual episode on a 1963 episode of Walt Disney's anthology TV series with new introductory segments. Ludwig Von Drake (voiced by Paul Frees) replaces Edgar Bergen as the narrator in the 1963 version, for which he has a Bootle-Beetle companion named Herman (replacing the sassy comments of Edgar Bergen's ventriloquist dummy Charlie McCarthy). An earlier version of the short was produced in 1955, replacing Bergen with narration by Sterling Holloway, as a stand-alone short in such venues as the 1980s TV show, Good Morning, Mickey!. This version also frequently aired alongside Dumbo during the 1980s. A brief clip of the short was one of many featured in Donald Duck's 50th Birthday. A third version of Mickey and the Beanstalk was on the Disney television show "The Mouse Factory", which aired from 1972 to 1974. This version starred Shari Lewis and Lamb Chop. The Ludwig Von Drake version of Mickey and the Beanstalk was released separately in 1988 in the Walt Disney Mini-Classics line. This version was then re-released in 1994, as part of Disney Favorite Stories collection. In 2004, the theatrical version of Mickey and the Beanstalk was released as a bonus feature on the Walt Disney Treasures set Mickey Mouse In Living Color, Volume Two. The TV version, featuring Ludwig Von Drake narrating, is available as part of the Disney Animation Collection (Volume 1). A jovial countryside land called Happy Valley, kept alive at all times by a singing harp, is suddenly plagued by a severe drought and falls into turmoil and depression after the harp is stolen from the castle by a mysterious assailant (and also nicknamed "Gruesome Gulch"). The residents are driven into poverty and forced to leave in order to avoid death by starvation. Eventually, only three residents are left: Mickey, Donald, and Goofy. The trio have but just one loaf of bread and a single solitary bean to eat. One particular night, Mickey is forced to cut the bread into slices so ridiculously paper-thin that you could see right through them. Donald, driven to insanity by starvation, attempts to kill their pet cow with an axe, but is stopped by the combined efforts of Mickey and Goofy. Mickey then decides to sell the cow for money to buy food. Goofy and Donald are excited about eating again and begin to sing about delicious dishes (to the tune of Funiculi Funicula) until Mickey comes back and reveals that he traded their beloved bovine for a container of beans, which he claims to be magical. An enraged Donald, thinking that Mickey had been tricked, furiously throws the beans down the floor and they fall through a hole. However, it turns out that the beans are truly magical after all as later that night, the light of a full moon causes a beanstalk to sprout from under the house and lift it far up into the sky. The next morning, Mickey, Donald, and Goofy climb the gigantic beanstalk and enter a magical kingdom of enormous scope, where they appear to be tiny creatures compared to their surroundings. They eventually make their way to a huge castle, where they help themselves to a sumptuous feast. There they stumble across the harp locked in a small box, as she explains that she was kidnapped by a "wicked giant". Sure enough, just then, a giant named Willie emerges from the shadows, grunting angrily but then suddenly breaking into a happy song ("Fe Fi Fo Fum") and bouncing a ball about while demonstrating rather amazing powers like flight, invisibility, and shapeshifting. As Willie prepares to eat lunch, he accidentally catches Mickey in his sandwich. Mickey sneezes when Willie pours pepper and tries to run away, but Willie catches him. Mickey plays palm reader and gains the childish giant's trust. Willie offers to show off his powers, and Mickey, spotting a nearby fly-swatter, asks him to change into a fly. However, Willie suggests turning into a pink bunny instead, and as he does he sees Mickey, Donald, and Goofy with the fly-swatter. Angry, Willie captures Mickey, Donald, and Goofy and locks them in the harp's chest so as to keep them from pulling any more tricks. In order to escape, Mickey must find the key and rescue his friends, and does so with the help of the singing golden harp, who begins singing Willie to sleep. Mickey almost alerts Willie to his presence by sneezing after falling into a box of powder in Willie's pocket, but the same powder makes Willie sneeze and he loses sight of Mickey. Mickey frees his friends and they make a break for it with the harp. However, Willie wakes up from his sleep and spots them, giving chase all the way to the beanstalk. Mickey stalls him long enough for Donald and Goofy to reach the bottom and begin sawing the beanstalk. Mickey arrives just in time to finish the job of cutting down the beanstalk, and Willie, who was climbing down, falls to his apparent death. Back in the narrator's home, the narrator (be it Ludwig Von Drake or Edgar Bergen) finishes his story, saying that with the return of the harp, Happy Valley returned to prosperity. The narrator then cheers up his companion (be it Herman or Mortimer Snerd), who was crying about Willie's death, saying that Willie was a nice giant who did not deserve to die. Just as the narrator says that Willie is a fictional character and not real, Willie himself appears, alive and well, tearing the roof off the narrator's house. Willie inquires about Mickey's whereabouts, but the narrator faints in shock while the companion tells Willie goodnight. The scene closes with Willie noticing The Brown Derby restaurant and putting it on like a hat before stomping off to find Mickey, with the HOLLYWOOD lights blinking in the background. During the 1940s, Mickey and the Beanstalk and Bongo were originally going to be developed as two separate feature films. In the late 1930s, Mickey's popularity fell behind Donald Duck, Goofy, Pluto, Max Fleischer's Popeye and Warner Bros.' Porky Pig. To boost his popularity, Disney and his artists created cartoons such as "Brave Little Tailor" and "The Sorcerer's Apprentice", the latter of which was later included in Fantasia (1940). In early 1940, during production on Fantasia, animators Bill Cottrell and T. Hee pitched the idea of a feature film based on Jack and the Beanstalk starring Mickey Mouse as Jack and with Donald Duck and Goofy as supporting characters. When they pitched it to Disney, he "burst out laughing with tears rolling down his cheeks with joy", as Cottrell and Hee later recalled. Disney enjoyed the pitch so much he invited other employees to listen to it. However, he said that, as much as he enjoyed the pitch of the film, the film itself would never go into production, because, as Disney claimed, they "murdered [his] characters". However, Cottrell and Hee were able to talk Disney into giving it the green-light and story development as The Legend of Happy Valley, which began production on May 2, 1940. The original treatment was more-or-less the same as what became the final film. However, there were a few deleted scenes. For example, there was a scene in which Mickey took the cow to market where he meets Honest John and Gideon from Pinocchio who con him into trading his cow for the "magic beans". Another version had a scene where Mickey gave the cow to the Queen (played by Minnie Mouse) as a gift, and in return she gave him the magic beans. However, both scenes were cut when the story was trimmed for Fun and Fancy Free and the film does not explain how Mickey got the beans. Shortly after the rough animation on Dumbo was complete in May 1941, The Legend of Happy Valley went into production, using many of the same cast, although RKO doubted it would be a success. Since it was a simple, low-budget film, in six months, fifty minutes had been animated on Happy Valley. Then on October 27, 1941, due to the Disney animators' strike and World War II which had cut off Disney's foreign release market caused serious debts so Disney put The Legend of Happy Valley on hold. Meanwhile, production was starting on Bongo, a film based on the short story written by Sinclair Lewis for Cosmopolitan magazine in 1930. It was suggested that Bongo could be a sequel to Dumbo and some of the cast from the 1941 film would appear as supporting characters. however the idea never fully materialized. In earlier drafts, Bongo had a chimpanzee as a friend and partner in his circus act. She was first called "Beverly" then "Chimpy", but the character was ultimately dropped when condensing the story. Bongo and Chimpy also encountered two mischievous bear cubs who were dropped. Originally, the designs for the characters were more realistic, but when paired for Fun and Fancy Free the designs were simplified and drawn more cartoony. The script was nearly completed by December 8, 1941, the day after the attack on Pearl Harbor. On that same day, the United States military took control of the studio and commissioned Walt Disney Productions to produce instructional and war propaganda films in which pre-production work on Bongo and early versions of Alice in Wonderland and Peter Pan were shelved. During and after the war, Disney stopped producing single narrative feature films due to costs and decided to make package films consisting of animated shorts to make feature films. He did this during the war on Saludos Amigos and The Three Caballeros and continued after the war until he had enough money to make a single narrative feature again. Disney felt that since the animation of Bongo and The Legend of Happy Valley (which had been renamed Mickey and the Beanstalk) was not sophisticated enough to be a Disney animated feature film, the artists decided to include the story in a package film. Throughout the 1940s, Disney had suggested to pair Mickey and the Beanstalk with The Wind in the Willows (which was in production around this time) into a package film tentatively titled Two Fabulous Characters. Ultimately, Mickey and the Beanstalk was cut from Two Fabulous Characters and paired with Bongo instead. By late 1947, Two Fabulous Characters was paired with The Legend of Sleepy Hollow and re-titled The Adventures of Ichabod and Mr Toad. Disney had provided the voice for Mickey Mouse since his debut in 1928, and Fun and Fancy Free was the last time he would voice the role regularly, as he no longer had the time or energy to do so. Disney recorded most of Mickey's dialogue in the spring and summer of 1941. Sound effects artist Jimmy MacDonald would become the character's new voice actor, starting in 1948. Disney, however, did reprise the role for the introduction to the original 1955–59 run of The Mickey Mouse Club. Celebrities Edgar Bergen and Dinah Shore introduced the segments in order to appeal to a mass audience. Jiminy Cricket from Pinocchio sings "I'm a Happy-Go-Lucky Fellow", a song written for and cut from Pinocchio before its release. Bosley Crowther of The New York Times wrote favorably that "Within the familiar framework of the Walt Disney story-cartoon, that magical gentleman and his associates have knocked out a gay and colorful show—nothing brave and inspired but just plain happy...And while the emphasis is more on the first part than on the second part of that compound, it's okay." The New Yorker wrote that "Walt Disney, who seems to have been aiming for mediocrity in his recent productions, has not even hit his mark" with this film. Time wrote "In spite of the Disney technical skill, it has never been a very good idea to mix cartoons and live actors. With genial showmanship, Mr. Bergen & Co. barely manage to save their part of the show. Most of the Bongo section is just middle-grade Disney, not notably inspired. And once Mickey & friends get involved with Willie, the whole picture peters out and becomes as oddly off-balance and inconsequential as its title." Barbara Shulgasser-Parker of Common Sense Media gave the film three out of five stars, praising the hand-drawn, frame-by-frame animation of the film, and citing it as an example of "the Disney accomplishment and finesse." She recommended the film to children who can handle peril and cartoon violence. TV Guide gave the film three out of five stars, claiming that the Bongo portion of the film is "maudlin and overlong", but that the Mickey and the Beanstalk portion is "highly amusing", praising character actor Billy Gilbert's characterization of Willie, the animation in the film, the live-action footage with Edgar Bergen and his dummies, and Cliff "Ukulele Ike" Edwards's performance as the voice of Jiminy. They noted that the film "is a relatively minor work in the Disney oeuvre", but "still quite entertaining". Dustin Putman reviewed the film with 2½ stars out of 4, saying that "Bongo" is frequently delightful, but with one caveat: it is glaringly antiquated in its views of romance and gender roles. The parting message—that a couple should say they love each other with a slap—is bizarrely funny for all the wrong reasons." They also described Mickey and the Beanstalk as "an amiable but forgettable telling of "Jack and the Beanstalk." Review aggregator website Rotten Tomatoes reported that 75% of critics gave the film positive reviews based on 8 reviews with an average rating of 6/10. Its consensus states that "Though it doesn't quite live up to its title, Fun and Fancy Free has its moments, and it's a rare opportunity to see Mickey, Donald, and Goofy together." By the end of its theatrical run, the film had grossed $3,165,000 in worldwide rentals with $2,040,000 being generated in the United States and Canada. Fun and Fancy Free was first released on VHS in 1982. It was re-released on VHS and LaserDisc in 1997 as part of the Walt Disney Masterpiece Collection. The film was re-released onto VHS and made its DVD debut on June 20, 2000 as part of the Walt Disney Gold Classic Collection. The film was released in a 2-Movie collection Blu-ray with The Adventures of Ichabod and Mr. Toad on August 12, 2014. ^ a b Sedgwick, John (1994). "Richard B. Jewell's RKO Film Grosses, 1929–51: The C. J. Trevlin Ledger: A comment". Historical Journal of Film, Radio and Television. 14 (1): 51–8. ^ Gabler 2006, p. 425–6. ^ a b c d e f g h i The Story Behind Fun and Fancy Free (VHS)|format= requires |url= (help) (Documentary film). Walt Disney Home Video. 1997. ^ Barrier 1999, p. 280, 309. ^ a b Barrier 1999, p. 309. ^ Thomas, Bob. Walt Disney: An American Original (2nd ed.). Disney Editions. p. 175–77. ISBN 978-0786860272. ^ Barrier 1999, p. 394. ^ Gabler 2006, p. 458. ^ Gabler 2006, p. 426. ^ "Color Titles from 'The Mickey Mouse Club'" (DVD)|format= requires |url= (help) (Bonus feature). Walt Disney Treasures: Mickey Mouse in Living Color, Volume 2. Walt Disney Video. 2005. ^ Crowther, Bosley (September 29, 1947). "'Fun and Fancy Free,' a Disney Cartoon, With Bongo, Escaped Circus Bear, Provides Gay and Colorful Show at Globe". The New York Times. Retrieved March 28, 2018. ^ "Disney With No Improvements". Vol. 23 no. 33. The New Yorker. October 4, 1947. p. 21. ISSN 0028-792X. ^ "The New Pictures". Vol. 50 no. 16. Time. October 20, 1947. p. 103. ISSN 0040-781X. Retrieved April 8, 2018. ^ Barbara Shulgasser-Parker. "Fun and Fancy Free". Common Sense Media. Retrieved November 12, 2017. ^ "Fun And Fancy Free". TV Guide. Retrieved November 12, 2017. ^ Dustin Putman. "The Adventures of Ichabod and Mr. Toad/ Fun & Fancy Free (1949/1947)". Retrieved November 14, 2017. 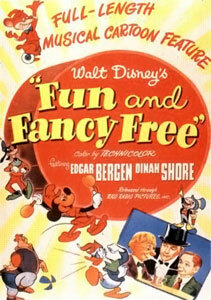 ^ "Fun & Fancy Free (1947)". Rotten Tomatoes. Retrieved July 31, 2016. ^ "Walt Disney Home Video Debuts the "Gold Classic Collection"". The Laughing Place. Retrieved March 28, 2018. ^ "The Adventures of Ichabod and Mr. Toad / Fun and Fancy Free Blu-ray 2-Movie Collection / Blu-ray + DVD". Blu-ray.com. Retrieved August 25, 2017. Barrier, Michael (1999). Hollywood Cartoons: American Animation in Its Golden Age. University of California Press. ISBN 978-0520256194.